I came into work today to two e-mails that will cause small headaches this morning. “Meh,” I thought, before moving on to looking at my list of what needs to be done for the Jay and Jack Plus updates today. “I need coffee,” I said aloud before heading downstairs to get coffee. 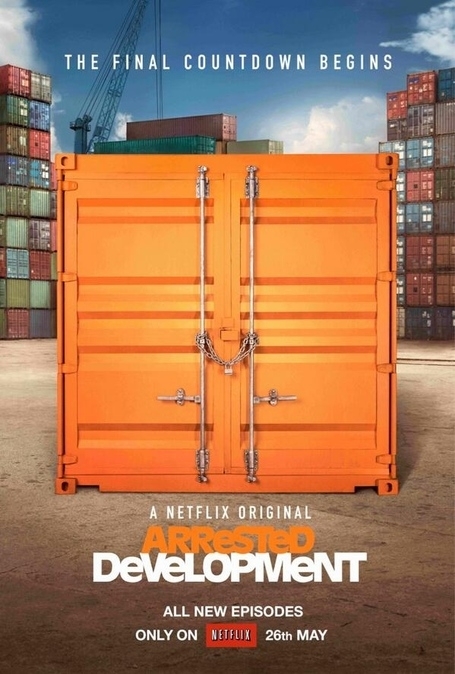 Netflix announced that the official release date for the new season of Arrested Development will be May 26 at 12:01 p.m. Pacific Time. They also said they’d made a “huge mistake” in originally telling fans that there’d be 14 new episodes…because there will be 15 new episodes! AAAAHHHHHH. If I could write this entire paragraph in CAPS and exclamation points and not be obnoxious about it, I would because I’m CAPS LOCKS EXCLAMATION POINTS EXCITED ABOUT THIS NEWS!!! Netflix CEO Reed Hastings said in February that he did not “anticipate” any further Arrested Development beyond these new episodes. Since then, however, Netflix has said that they “remain hopeful” that there could be a scenario for more AD down the line. Jay & I contributed to the Kickstarter campaign last month to bring back Veronica Mars as a feature film. We donated at the $35 level. I have long been a Veronica Mars fan – from the days when it was still on UPN – so I was happy to contribute, even though I figured that they’d hit their goal. In fact, I think I went on record during several MetroBuzz episodes that I may love the first season of Veronica Mars more than I love the first season of Lost. Yup, there, I said it again. If you can watch it and not spoil yourself, then you’re greatly enhancing your life, because it is worth every last minute you put into it. Okay, movie people! If you somehow come across this, please don’t sue me! I promise not to do it again! Other announcements on today’s Kickstarter update are definitely things to spread the word about. There’s now a Twitter account for the Veronica Mars movie: https://twitter.com/veronicamars and an Instagram account, too: http://instagram.com/theveronicamarsmovie. Man, I can’t wait for more updates or for the movie. If you haven’t seen Veronica Mars yet, definitely check out season 1 and avoid being spoiled. I promise you it will be worth it, so trust me. I am going to do a rewatch and hold discussions about it on the Jay and Jack Facebook page, so feel free to join in. This entry was posted in Arrested Development, TV and tagged Arrested Development, Arrested Development on Netflix, Netflix, Veronica Mars. Bookmark the permalink.